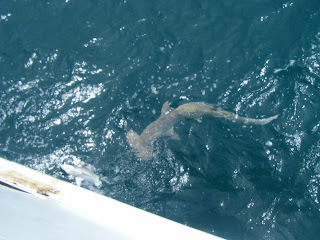 It was afternoon when we caught a sharpnose shark, a silky shark and 6 blacknose sharks. This was very exciting because the blacknose shark is the chief scientist’s project out here in the Gulf. 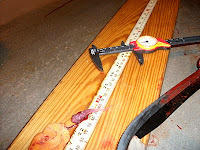 In order for him to make observations of age, maturity and reproduction, he has to dissect the shark. Three of the blacknose were put back in the ocean after they were weighed, measured and tagged. The other three waited for dissection. I watched as the three sharks were dissected and the only part that cause me to look away was cutting off the head. Some of my team members were so excited because they could keep the head and later remove the jaw. That is a lot of work, which I do not have the patience for, so I will not be bringing home a shark’s jaw and teeth. If there is time, one of the observers said she would prepare a jaw for me. Even if I do not get the jaw, I will be bringing back a shark fin, shark blood and several shark embryos. The shark fin is currently drying out and the embryo is being stored in ethanol, which is used for all specimens. I won’t go into all the gory details, but the scientist removed the entire reproductive system. He was looking to see if the shark had given birth and he can tell this by the color of the uterine tissue. The sharks collected, had produced 4-5 embryos each. The yellow yolk is a soup like fluid that the embryo feeds on the nutrients from its mother. There is a thin mucus that covers both the embryo and the yolk. It reminds me of a chicken’s egg. 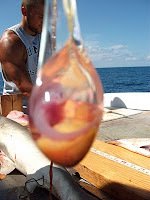 Each shark embryo was measured and cataloged. 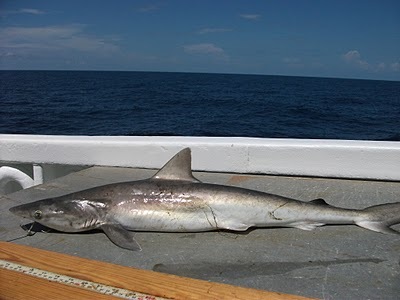 The data will be used when the scientist writes his paper on the reproduction of sharks, which will then be published. This evening there was a good deal of excitement on board. We were hauling back our catch when the line broke. The thought was that it could be caught on something on the ocean floor or a small reef. It also could be that the line snapped because there was a large shark on it. This is not a common occurrence, but it has happened before. When this happens the ship sails to the last hi-flyer and we work our way backwards. In the end, everything was accounted for. This really was no ordinary night. We were about 40 miles off shore from Cedar Keys, FL, at about 11 P.M., when we saw a small boat drifting about 3/4 mile from us with no lights on. The officers on the bridge saw a red flare shoot into the air, so they knew the boat could be in distress. Our ship got close enough so that they could shine a light onto it and kept track of them as it drifted. The NOAA officers talked to the boaters via radio and discovered that they had left port at 7 A.M. and that the motor on the boat kicked out about 2 P.M. They had been floating for nine hours and in a boat they could not repair. We were so far off shore, it was certainly understandable that they were very relieved to see us and get the help they needed. Along the coast there is a company called “Sea Tow”. Their job is to haul in boats that are unable to get to land by themselves. You do have to pay for this service and it is like having car insurance, but costs a whole lot more money. Luckily this boat had that insurance, so Sea Tow immediately started out to get them. In the meantime our ship monitored them. They said they were OK and didn’t need any supplies, they just wanted to get on land. Sea Tow reached them about 4 A.M. and the Captain thinks they probably docked about 10 A.M. Thank goodness the Oregon II was out there, because they would have floated out there for many more hours before being seen by another ship. I asked the Captain what would happen if the boaters did not have Sea Tow and he said they would have called the Coast Guard, who in turn would come out to rescue them. This is like a story you hear on the news. This officers and crew feel they were just doing their job. They are very humble indeed. Speaking of dress, I thought you would like to know what I am wearing while I am here. It is so warm here that shorts are in order. Sometimes I wear sleeveless shirts, but most time I wear short sleeve shirts. I am wearing sneakers, but wish I had rubber boots. My sneakers are soaked just about everyday. Luckily the engine room is hot so I can put my sneakers there to dry. Rubber gloves that are heavy and have a very thick layer of weaved cotton one one side are always worn when we are catching sharks and fish. They really don’t protect you so much from bites, but rather from the scales of these animals, which are like little knives. Whenever you are catching fish, you have to wear either sunglasses or safety glasses. Hard hats are required anytime machinery is being used, which is when we put sharks in the cradle. Finally and most important is a PFD. They are not too heavy and come equipped with flashlights in case of an emergency. My challenge is to make sure I have everything when I need it. We put out lines on the stern of the boat, but catch them on the bow, so we are not always working in the same place. It sounds simple, you just have to get into the routine, which I almost have down. We are starting to move more quickly up the coast of Florida and continuing to complete stations as we go. We will be back in port on Sunday. The ship can sail at about nine or ten miles per hour, so it will take us awhile to get back to Pascagoula at that rate. The time on this ship is going by so fast, it’s hard to believe I have been on this ship for over a week!Answer to question of the day: There are many, many ways that the officers and captain can communicate with ships. One way is GMDSS,which stands for Global Maritime Distress Safety System. This system has many components, some of which are overlapping and the expectation is that boaters will have some of them on their boats, whether they are commercial or recreational. There are computer systems, whistles, flags, and a lighting system that uses the Morse Code. As you can see this is very complicated. There are courses that captains and officers have to take in order to understand how the communicate and keep a boat or ship safe. “Animals Seen Today” sharpnose shark, blacktip shark, red groupers, red snappers, nurse shark, blacknose shark. A sandbar shark that was much darker that the one we saw a few days ago. A few days ago we caught a great hammerhead, which is a light gray color and different from the scalloped hammerhead. 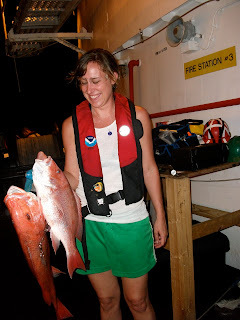 This entry was posted in 2010, Annmarie Babicki, NOAA Teacher at Sea and tagged hammerhead shark, longline survey, Oregon II, red snappers, shark embryo, sharks. Bookmark the permalink.